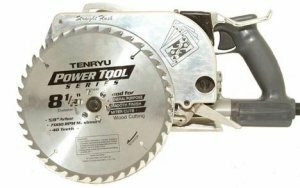 His circular saw design has no table support on the blade side of the tool and therefore allows for cuts right up against a stud, or wall. The saw also uses a rather large 8-1/2" blade that gives the saw a full 3-3/16" of cutting at 90-degrees. It also has the unique ability to make cuts from the front of the saw by folding up the front portion of the saws table. Because the blade is so large, the Straight Flush makes use of a trigger actuated blade guard to keep your hands away from danger. If you are brave enough to give a new saw design like the Straight Flush a try, it can be yours for $475.00. To see the Straight Flush in action, see SulSaw's post in the ToolRank forums here.